turn off CoRd 62 opposite County gravel pit (see map). Out in the furthest is Battleship Island. The Pretty View from the Deer Lake Look-out on Co. Rd. 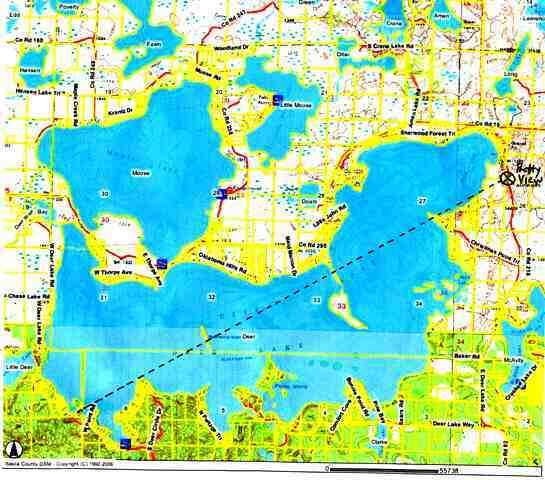 62 goes all the way across the length of Deer Lake, from north east to south west. 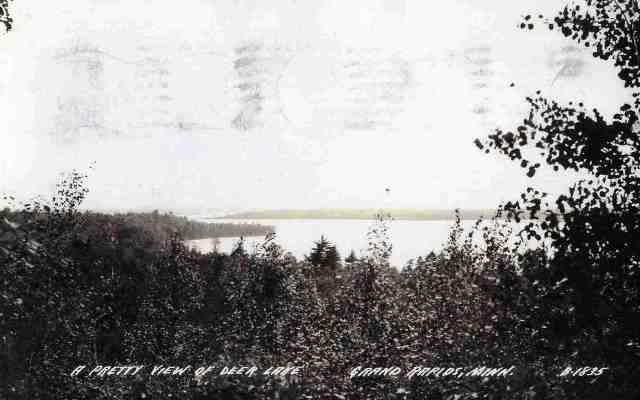 The postcards in this historical series show a view of Christmas Point in the close foreground (blocked in later photos by an insistent Norway pine); Christmas Point is the first of the three alternating points that make this view famous. 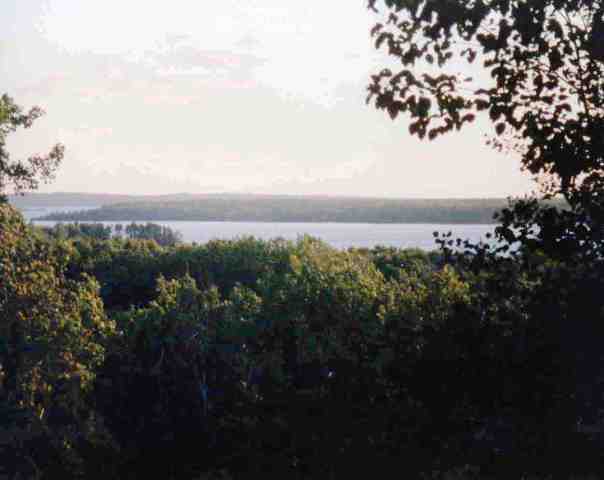 The second point, clearly seen in all the pictures is the narrow peninsula extending from the Deer Path area toward the straits of Bear Island. The third point in the distance is Battleship Island. 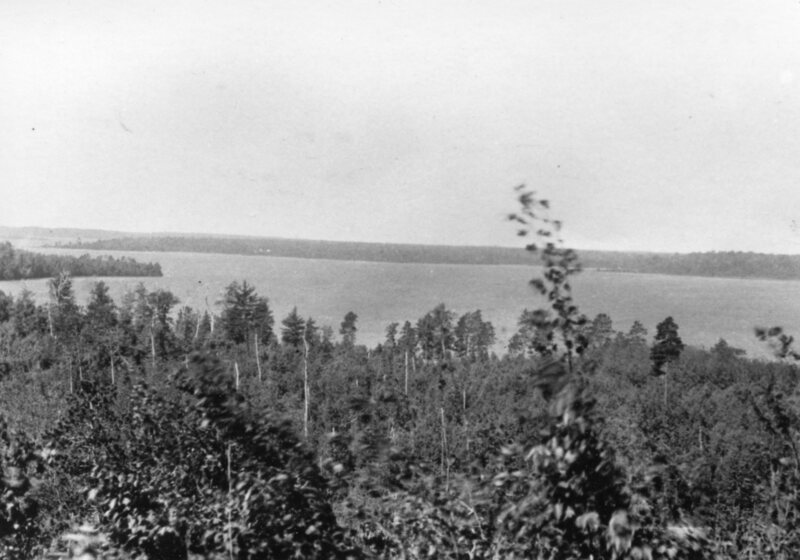 The picture directly below is dated 1935 where the triple point view can be seen if you look closely on the left of the photo. Christmas Point is quite obvious. The next picture is a postcard with a postmark of 1942, and was obviously taken just a few years before the one right after, which dates it to the early 50's. 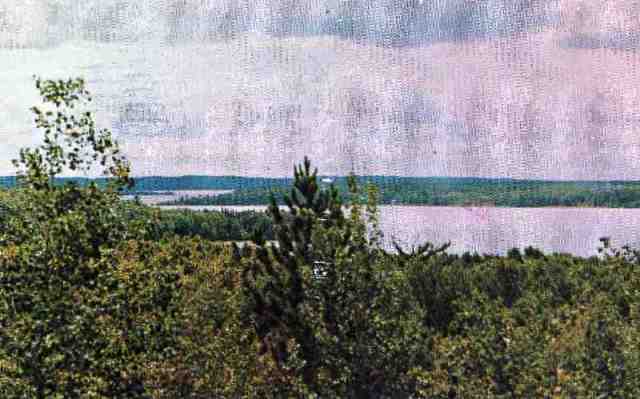 In the following one, from the 1980's, you can almost make out Christmas Point (more elevation might have shown it clearly) because the Norway is gone. 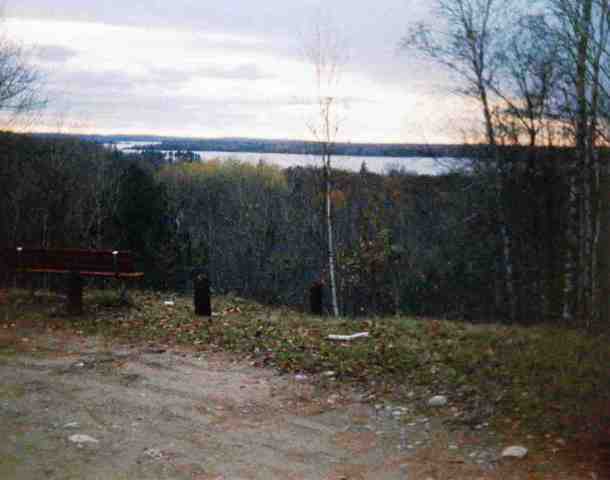 The next photo shows the bench that was installed in the 1990's, with a birch sapling. Today (2000's picture) the Pretty View has become rather overgrown, but the County Park department has plans to improve the view. 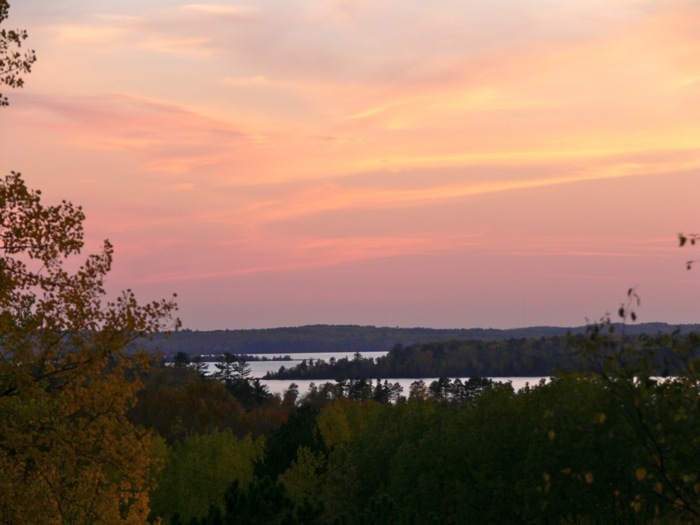 The "Eagle Flies" photograph was taken at dawn in the Fall of 2006 by your webmaster who was standing on top of a 10-foot ladder placed on the roof of his pickup (perhaps a 20 foot elevation off the ground). If you look carefully you will see a bald eagle flying above the lake--a lucky shot if ever there was one! 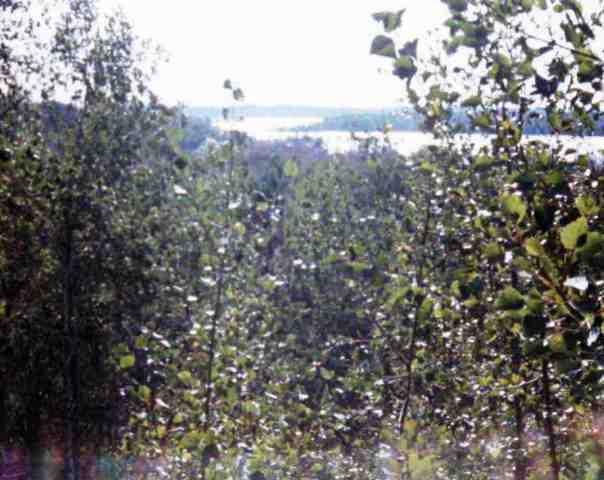 But even that high off the road, Christmas Point is completely obscured by trees further down the hill; only the red pine tree-tops can be seen. Today (2014) the view from the bench is rather minimal: clearing needed! Around 2000: from the bench. The view below, 20 feet above the bench (on top of a ladder on top of a truck), is still clogged by growing trees and brush. 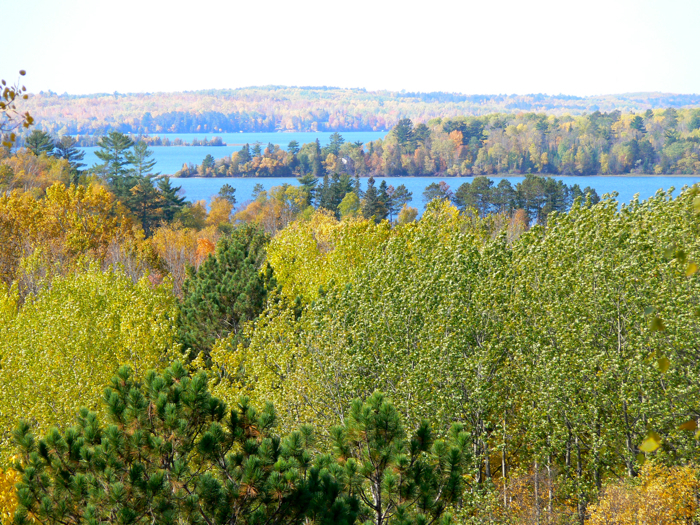 Off-leaf seasons reveal more of the Pretty View. April 1, 2016, Pretty View after snow. then Battleship Island in the distance. Christmas Point is evident only by the tops of pine trees, visible in the last three photos above. These more recent "Pretty View" photos were taken from an elevated position 20' higher than previous historical photos.